I have just returned from a series of lectures on Holocaust archaeology. They were engaging and serious, but the discussion was ruined by a callous argument about the Roma victims of the Holocaust. The Roma term for the Holocaust is the Porajmos, which literally means the “Devouring”. Hundreds of thousands of Roma people were murdered by the Nazis. (For the purpose of this article I have used the term Roma to include Sinti and Traveller communities). In a workshop titled “Excavation and the recovery of human remains”, one historian argued that the religious and ceremonial rites, which are rightly given to Jewish and Christian victims’ remains, did not need to be observed in the case of the remains of Roma or Sinti people. Why? Because according to some of those present, the Roma do not hold religious beliefs. This argument was supported by several academics at the conference who cited the work of H Greenfeld, The Gypsies, as evidence. It was also claimed that the Roma have no sense of their historical past and therefore it was difficult to create a collective commemoration. This post will attempt to refute those claims. For in my opinion this debate has little to do with respecting the victims of the Porajmos but everything to do with modern-day racism and prejudice. Before I do this I want to try and explain the roots of this debate. Of course the main victims of the Nazis’ Holocaust were the six million murdered Jewish people. But they were not the only victims. Yet from the time that the Nazi concentration camps were liberated, the Roma were written out of the narrative of the Holocaust. The German government has paid reparations to Jewish survivors of the Holocaust, but not to the Roma. There were never any consultations at Nuremberg or any other international conference as to whether the Roma were entitled, like the Jews, to reparations. Up until the 1990s, the genocide of the Roma was not recorded or remembered at many concentration camp or death camp sites. The former West Germany state only recognised the genocide of the Roma in 1982. Only in the last year of the war did the Nazi ideologues begin to regard the Gypsies not only as an undesirable social element but also as an undesirable racial element. The Nazi policy towards the Roma was indeed full of contradictions, but the arguments put forward by Bauer and Davidowicz are plainly untrue. The deportations to Auschwitz were not the beginning of racial assessments. As early as 1934 the Nazi authorities confined all Roma in so-called Gypsy camps (Zigeunerlager). Marzahn in Berlin was one of the most infamous. Hundreds of Roma died in these camps. In 1937 scientists working in the Office for Research on Race and Hygiene and Population Biology in the Reich Department of Health were producing tables of the racial characteristics of Gypsies. The Nazis’ invasion of Russia in 1941 marked the transition from persecution to mass extermination. 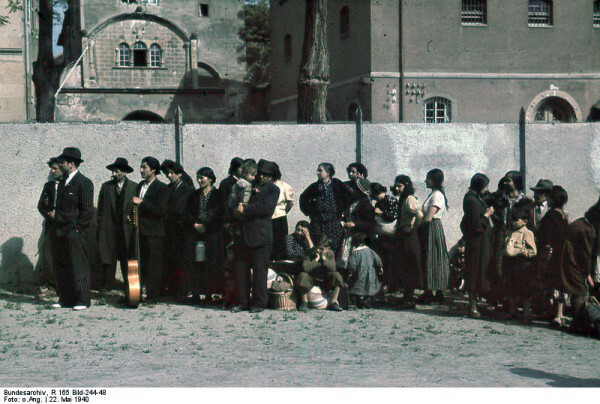 Einsatzgruppen and other mobile killing units killed over 30,000 Roma at the same time as they killed Jews and Communists. One day, while I was working near the gate, I noticed the Germans and Ukrainians making special preparations…meanwhile the gate opened, and about 1,000 Gypsies were brought in (this was the third transport of Gypsies). About 200 of them were men, and the rest women and children…all the Gypsies were taken to the gas chambers and then burned. It is not known precisely how many Roma were killed in the Porajmos but historians originally estimated that the Nazis and their allies killed between 220,000 and 500,000 Roma. In recent years the figure for the number killed has been dramatically increased. Previous underestimations are a result of Roma people being grouped with others in Nazi records under headings such as “remainder to be liquidated”, “hangers-on”, and “partisans”. And studies of the little-known Lety concentration camp in the Czech Republic revealed that between 80,000 and 100,000 Roma were murdered there. The second reason this debate is re-emerging is because over the last few years new archaeological excavations are taking place at a number of concentration and death camps. Most important are the excavations at Sobibor and Treblinka. They have provided invaluable evidence of the workings of these mass killing centres and the scale of the mass murder committed. Given the sensitive nature of these investigations, much of the archeological work is non-invasive and uses remote sensing technologies. The pits where hundreds of thousands of people’s remains were buried are not disturbed. However, in addition to the remains in the main burial pits, victims’ bodies are found all over the camps. Testimonies by camp survivors show that prisoners deliberately hid many of the bodies that are now being uncovered in order to provide evidence of the atrocities that the Nazis committed. The excavations at Sobibor and Treblinka provide a model of how to respect the religious and cultural heritage of the victims. At both sites, cremated and non-cremated human remains were located on the surface of the extermination camp area and also during the excavations. All of these remains were reinterred by a representative from the Office of the Chief Rabbi of Poland. So what about the Roma? The starting point for campaigners, historians and archeologists cannot be ignorance of Roma culture and rituals. Instead it has to start with the Roma themselves: just as with Jewish or Christian victims of the Holocaust, community representatives need to be consulted and their wishes put into practice. The outrageous assertion that Roma people hold no religious or spiritual beliefs would be rejected if historians spoke to Roma people. Many Roma have deep rooted spiritual beliefs. Some are Christian, others are Muslim and others are Baha’i. Yes, there are some Roma who do not hold religious beliefs, but they do have an oral culture of remembrance. The fact that there are few written Roma accounts of the Porajmos has nothing to do with a lack of remembrance. Roma people have a strong oral tradition, but have also been denied basic education and human rights. Would anyone claim that the reason there are so few written testimonies by black slaves is because they had no sense of community or collective remembrance? The most important reason why there is a debate raging over remembrance of the Roma victims of the Porajmos is because Europe’s Roma refuse to be hidden from history. Roma groups are campaigning to get their history recorded and memorials erected. This is part of a wider campaign against the severe racism Roma people are facing across Europe today. As a Romani descendant of Holocaust victims, I very much appreciate this article. Indeed, hundreds of thousands of Roma and Sinti were killed, and commemoration gatekeepers as well as historians often trivialize or erase this fact for politicAl or other reasons. However, I have absolutely no idea where you got the numbers for Lety. Only a fraction of that number was actually killed or was even brought to that camp. You will help us more by sticking to verifiable sources. Thank you. Who should I shout at ? This is outrageous. Hi Petra, thanks for your comments. You are right about the numbers killed at Lety. The point I wanted to make was that the number of Roma killed in the Porajmos is much greater than first thought. Hancock’s research in to the numbers murdered at Lety demonstrates that it was 10 times higher than the first estimates and Ackovic’s revised the estimates of Romani killed by the Ustaše which he believes was between 80,000 – 100,00. You could start with the Nazis. But I don’t think it is a question of shouting at people. The first thing all anti fascists and anti Nazi campaigners should do is educate people about the Holocaust and its victims. Secondly oppose the racism and prejudice aimed at Europe’s Roma, Sinti and traveller’s and support their fight for their civil rights. Good point. Good deal. Good history! Ushten, Rromale! Rease up, Rroma people!!! Thank you for a very thoughtful and useful clarification. I hope that people writing about the Nazi tyranny in future will not make these sacrilegious attacks on the sufferings of Roma people and the culture for which they were unjustly killed.